Thank you for entrusting the care and attention of your pet to Natterjacks Vet Limited. This document details our Practice Terms and Conditions. By registering your pet/pets with the practice you agree that you have read and understood our conditions of business and agree to be bound by them, should you require any clarification of any aspect of the terms then please ask. 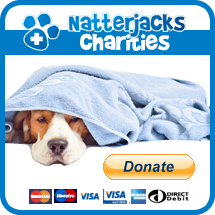 Natterjacks Vet Limited strongly supports the principle of insuring your pet against unexpected illness and accidents. Please ask for details about insurance from any member of staff but be aware though that with any insurance company it is your responsibility to determine your level of cover and then to reclaim any fees you have paid the practice. It is also your responsibility to pay any excess that may be set according to your policy and to have knowledge of any condition exclusions. In certain instances, when clients do not have the funds to make payments in full, arrangements can be made for your insurer to make their payment directly to us but this only applies to particular insurance companies and even then, when sums involved are high enough. Please ask for details if you would like to be considered for this facility. We hope to ensure you never have recourse to complain about the standards of service received from us. However, if you feel that there is something you wish to raise, please direct your comments within 28 days in writing, to admin@natterjacksvet.com. An acknowledgement will be sent by return and then a period will elapse while the case is investigated and reports collated from those staff involved. A reply in writing will follow, usually within 28 days although the period may be longer if the Practice Manager of staff involved are temporarily unavailable or delayed.